Can We Know the Truth About Iran? Journalists Omid Memarian (left) and Laura Secor (middle) speak with Hadi Ghaemi, co-founder of the International Campaign for Human Rights in Iran (right). Moderated by Andrew Meier, Associate Professor of Journalism, the discussion was about the realities of reporting in Iran. “In the eyes of the Iranian government, a foreign journalist is the same thing as a spy,” according to Hadi Ghaemi, co-founder of the International Campaign for Human Rights in Iran. 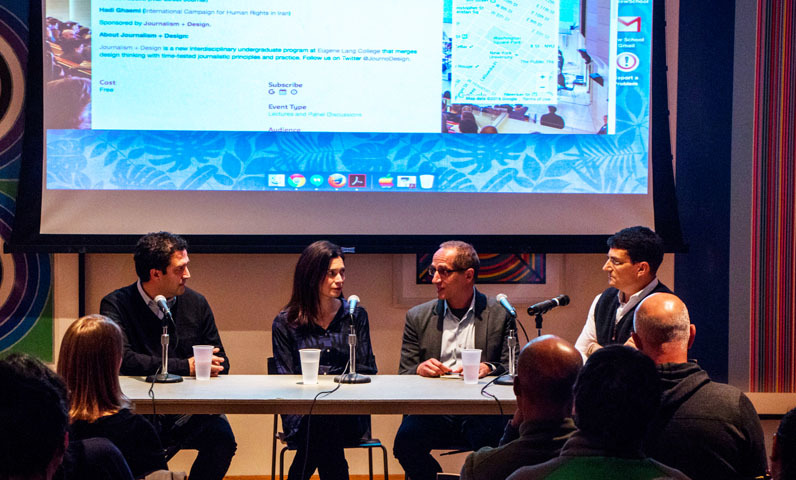 Ghaemi was speaking about the realities of life for a reporter in Iran, alongside Laura Secor, a writer for the New Yorker, the New York Times Magazine, and Foreign Affairs, as well as Omid Memarian, who has written for The Daily Beast, Time.com, and the Wall Street Journal. Moderated by Andrew Meier, an associate professor of journalism, and sponsored by the Journalism + Design program, the discussion touched on everything from the role of a journalist in Iran to how Americans perceive Iranians to how Iranians feel about Donald Trump. The motivation for organizing the panel came in part from the release of Jason Rezaian, a Washington Post correspondent and Lang alum (’01). Jason was held for roughly 15 months in the notorious Evin prison in Tehran on dubious charges of espionage. Jason was eventually released as part of a prisoner exchange negotiated between the U.S. government and Iran, which included three other Americans and the release of Iranians from the United States. Jason is both an Iranian and an American citizen and, as such, has more freedoms to travel between the two countries and report on the current political climate than someone with only U.S. citizenship. Iran may block Facebook and Twitter, but that has not stopped citizens from remaining up-to-date on American politics, particularly with regard to Donald Trump. While many older people in the United States are challenged by the fast-paced world of social media, Ghaemi sees everyone in Iran on social media, even older people. The media typically covers Iran through the lens of the hostage crisis in the 1990s or the current nuclear crisis, but Secor is hopeful that that will change soon. “While the depth of what I cannot see or report on is staggering, I think that now that the nuclear deal has been accepted, we can report on Iran in an objective way and not focus on the nuclear angle of the story,” said Secor. Reporters in Iran may have to compromise their coverage in order to stay, something everyone on the panel agreed upon. The Iranian government’s distrust of media results in stories that are not fair or objective but that allow the reporters to come back to Iran, rather than be banned after an unfavorable story. “Iranian society is very active, and they have their eyes towards the United States and Europe. They are fascinated by the idea of a civil society, and after the most recent elections, they are optimistic,” says Memarian. The human rights situation in Iran is still of great concern, but with a new group in power, everyone on the panel agreed that change is possible. Western media can play an important role in highlighting human rights violations, but the conversation has to begin with Iranians, said Ghaemi.